This stunning image of globular cluster M2 was taken by astrophotographer Ron Brecher from Guelph, Ontario in September 2013. Stars appear to flow out like water from this stunning image of globular cluster M2. The image was taken by astrophotographer Ron Brecher from Guelph, Ontario in September 2013 and recently shared with Space.com. "It's a pretty splash of stars through the eyepiece in any size of telescope, but to see the colors of the cluster stars well you need to image it (although there are stars nearby that are colorful in the eyepiece)," Brecher wrote in and email to Space.com. 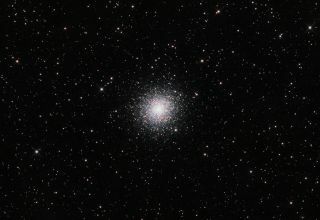 M2 is a bright globular cluster located in the constellation Aquarius. Globular clusters orbit around the main body of our host galaxy, the Milky Way and contain several hundred thousand to a million stars . This one has about 150,000 stars, the brightest being red and yellow giants. "This cluster is so eye-catching that it is easy to miss seeing some of the many galaxies in this field,” he added. Photo details: Brecher used a SBIG STL-11000M camera, Baader LRGB filters, 10" f/6.8 ASA astrograph, Paramount MX. Guided with STL-11000's internal guider, Focus with FocusMax and all controlled with CCD Commander.